Heading through the New Forest towards Ringwood take the exit off the A31 marked Poulner, Hightown and Crow, go up the slip road until you reach the roundabout at the top, go straight across as though you are heading back towards the A31, but take the turning on the left before you reach the A31 again, into Eastfield Lane. Follow this down until you reach the junction with Crow Lane on the right (opposite the Elm Tree Pub). Turn on to Crow Lane and follow the road for a while, you will find us on the right. Route is marked with Brown Tourist Attraction Road Signs. Take the exit off the A31 just past the main Ringwood exit marked Poulner, Hightown and Crow. At the roundabout at the end of the slip road take the first exit left. Follow that road until you reach a T junction, keeping to the left, and turn left, which will take you over the A31, until you reach a roundabout. Take the exit to the right as though you are heading back on to the A31, but take the turn off on the left into Eastfield Lane before you reach the A31. Follow this down until you reach the junction with Crow Lane on the right (opposite the Elm Tree Pub). 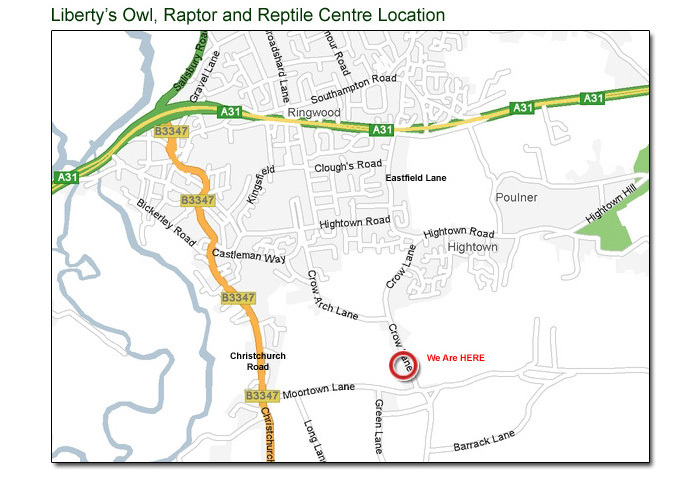 Turn on to Crow Lane and follow the road for a while, you will find us on the right. Route is marked with Brown Tourist Attraction Road Signs. Take the B3347 Christchurch Road towards Ringwood, passing through Kingston. Just after entering the outskirts of Ringwood turn right onto Moortown Lane (just before the Petrol Station. Follow that up to the first turning on the left into Crow Lane. Take Crow Lane and we are 250 meters up on the left hand side.